Why Vision Tools CathView ? The cath lab Workstation of choice. Vision Tools CathView is a powerful stand-alone workstation for viewing, processing and managing X-ray images and cine-loops from vascular cath lab X-ray modalities. 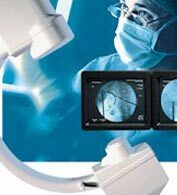 Vision Tools CathView is a very powerful and scalable acquisition and viewing station for cath lab machines that can be connected to any type of cath lab machine whether it is dicom or non-dicom "using video or digital interface". With its archiving capabilities, static and dynamic image viewing, variety of processing tools including QCA/QLVA analysis and road mapping , printing features and structured vascular reporting, the Vision Tools CathView application can be considered as an ideal solution for most cardiologists. The X-ray Workstation of choice. One of the important features of Vision Tools CathView is the capabilities to display multiple cine loops at the same time for comparison and processing. The CathView system can play from one cine loop to 12 cine loop per view monitor. Each cine loop can be processed alone and a group or all the cine loops can be processed together. adding filters, changing the brightness and contrast, sharpening and smoothing, embossing, edge enhancements and many more. Receive and archive studies from DICOM modalities using different rule-based compression and routing configurations. Support DICOM Store SCP/SCU and Q/R SCP/SCU. Archive/Manage studies aided by multiple search criteria and search filters to retrieve the selected studies asap. Import studies from CDs or USB flash disks or other portable media. Create DICOM CDs/DVDs with built in Viewer for any studies in the work list. Unified Patient Jacket to have a 360 degree view of patient history, old visits, old reports and attached documents. Multiple search criteria and search filters to retrieve the selected studies on the fly. Scan Images from any attached film scanner and save it into current study. Send studies to any other DICOM server or device. View studies in multi-monitor configuration. Multi-format display with up to 35 images per monitor. Do windowing, zoom/pan, annotations and multiple measurements. QCA / QLVA analysis option. Multiple image filters for edge enhancements, sharpen, smoothing, ...etc. View Dynamic studies with Cine-Loop features for play-back controls. zoom/pan and windowing. spacial filters can be included while playback. Support for multi-frame images generated from modalities. Produce fancy looking print-outs on films or papers whether on DICOM printers or normal windows printers with the ability to design free film formats and templates, print true scale images, ... etc. Visual Film Designing and operation (Visual Filming on Screen, What u see is what u print). Film Template Designer (Free format). Visual processing of images on film (e.g. window, zoom, pan, filters, measurements, etc.) . Printing Films on both A4 paper printers and DICOM printers. For Non-DICOM cath lab, the best interface will be Video grabbing, by which, the CathView workstation aided by a remote keypad can acquire images and cine-loops from the cath lab modalities one-by-one or interface the operapro station directly with the x-ray generator ready signals to acquire image or cine loops directly from the x-ray during the operation. The CathView station can be provided with dual monitor in order to display all the operations done on the main monitor installed in the control room to a second monitor installed in the machine room it self. The second monitor can do automatic replay of the acquired cine-loop and is very useful for Road mapping functions. Modality DICOM Worklist " MWL SCU "
Retrieve DICOM modality worklist from any EMR / PACS server . This eliminates the need to re-insert patient information again before starting examination and acquisition . This add-on is for non-DICOM modalities in a EMR/PACS environment. Perform quantitative coronary analysis measure stenosis percentage and also quantitative left ventricle analysis to measure the ejection fraction of the heart in an easy and accurate way directly in the Cathview application and away from the modality itself. Automatic reporting with simple mouse clicks and choices for pre/post procedure. Complete Reports for coronary catheterization and interventions. Guidance through procedure and post – procedure notes. Automatic Reporting Scripts pre-stored in the system. Wall motion Diagram for Echo Reporting.